No idea to AV- which one means I never have to see any of you again? 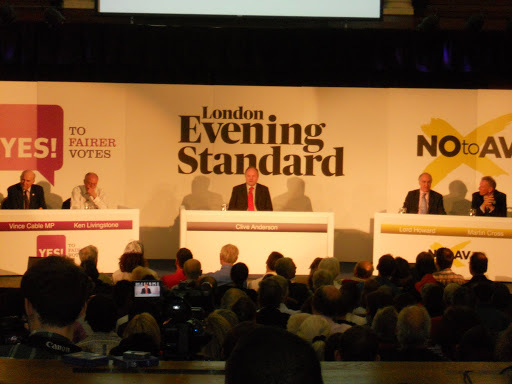 I went to an event at the London Evening Standard about the change to the voting system. For the ‘Yes’ campaign, Vince Cable and Ken Livingstone, and for the ‘No’, Lord Michael Howard and some Olympic rower. It transpired, inevitably, that the ‘Yes’ campaign were not arguing for their preferred system, Nick Clegg called AV a ‘miserable little compromise’ some time ago. Today, some of the country might vote on an historic referendum to change the way our country elects its representatives. Why, in such an objectively sensitive change, are people not more engaged? It is the wrong argument- even the people who want a change don’t want this change. It’s hard to argue convincingly for something you don’t really want. For those who don’t want change, they have done everything in their power to emphasise its complexity. Implying we can’t all count past one. Both teams have accused the other of deception, from the expense of fictitious voting machines to what system delivers what outcome. If you were so confident in your position and respected the people who you are trying to win over, WHY LIE? The media elite, the people charged with explaining the system, learned journalists, have feigned bafflement at such a difficult new thing. Who are these people? To most, it just doesn’t matter. A lot of people don’t vote anyway, possibly because the people who reach the top of political parties are not representative of normal people. What vote? I called the Electoral Commission to find out where my leaflet was and they said one had been delivered to every household. I didn’t get one. Oh and the Royal Wedding, the bank holidays and now Public Enemy No. 1 is dead. A great time to bury potentially life changing but politically devastating news. On the eve of the vote on AV, I would, if there was the option, urge you all to vote ‘re-open nominations’. Which system will allow more people to get involved, because I’m sick of this. Led by a laughable, disgraceful field of people who are frankly crooks, liars, cronies. Men who, let’s face it, cannot keep their hands to themselves. In one way or another. Gaffy nerds who wouldn’t know the big society if it was outside, just before the gated wall protecting their new money/old money first, second or third home. Sadly, today, there will be no revolution here. This entry was posted in AV, corruption, politics, UK, voting on May 4, 2011 by kirstystyles1.